Perhaps the most valuable asset a potential RV buyer could ask for would be a dealership staffed by people with a lot of experience in the ever-changing world of recreational vehicles. 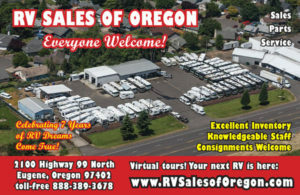 That’s what everyone finds when they visit RV Sales of Oregon, where having decades of experience is normal for a member of their team. The company itself is only eight years old, but the knowledgeable and friendly people who run the operation have a lot more time invested in the RV industry. Their experienced, knowledgeable RV technicians work out of a 4,000-sq.ft., three-bay indoor facility that handles RVs of any make or size, from tent trailers to the largest Class A motorhomes. Secure, well-lit overnight parking is always available. From winterizations and oil changes to troubleshooting and major repairs, they’ll get your RV back on the road in top shape. 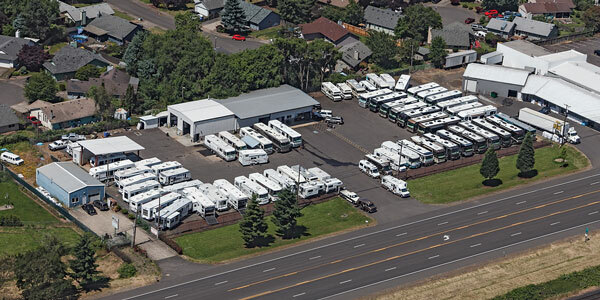 They offer a wide range of top-quality used and consigned RV’s of every kind, from campers, travel trailers, and 5th wheels to smaller gasoline and larger, diesel-pusher motorhomes. Few things get Gary more excited than helping RVers and their families get out sharing stories around the campfire. Whether you’re a long-time RV enthusiast or just getting started, Gary will make sure you’re comfortable and confident when you pull out of the lot with your new RV. For Craig Thompson, selling RVs is as much a passion as it is a career, and it shows! With rare expertise and good humor, Craig can help you find just the RV you’re looking for. He’s also the consignment specialist who can help you sell the RV you own now. He always has the coffee pot on and is always ready to talk. Tyler McAllister says that he grew up in the RV business, because his father was a partner in Beaver motorhomes during the late 1970’s. Since that time, he has owned a company that built 5th wheels, been a factory rep for several companies, sold retail at a large well-known RV dealership and finally landed at RV Sales of Oregon. “In all of my travels and with my past experience I can truly say there is no better place to buy your next RV,” Tyler said. Skilled, experienced, patient and an all-around nice guy, Shane Prom is the Service Manager at RV Sales of Oregon. He also brings two decades of RV service experience to the job each day. With a terrific support staff of fellow RV specialists, Shane makes sure maintenance and repairs for your RV are completed right on time and right the first time. They are located on the west side of Hwy 99N in Eugene, with a main driveway right on the highway.